It’s kind of funny how I ended up running over 50 miles today. I certainly did not initially plan to. You can blame this on my crazy extraordinary friend Alene. Some background: seven years ago, she ran the famed Badwater Ultra 135-mile course in the desert… twice. Running the route once, evidently, was not ambitious enough, so after finishing the actual competition, she ran back to the start for a 270-mile total. I crewed for her during the entire stint, including bringing her a pizza in the middle of the desert. And paced her for a little bit at night while she hallucinated about Spongebob Squarepants. The race I’d signed up for on July 21, the Lactic Acid Trip 24 hour, in Bailey, on a track, got postponed until October. Since I don’t know that I can make it and the weather could be an issue in October, I decided to make my own 24 hour run. I asked around for some places where I felt I could run safely all night in a loop that would allow me easy and frequent access to my aid station. My friends Crisann, Felix, and Joanne all live in a quiet neighborhood in the north part of town and Crisann offered to let me use her house as my aid station and bathroom. The benefits of this run would be a safe place to run alone in the dark, multiple short loops for variety yet easy aid access in case of hot weather, the availability of a deep gravel path similar to the conditions I’ll encounter at Across the Years, and little traffic. Alene dubbed this little summer adventure the Do-It-Yourself 50 Mile. Since she was going to be running laps in my neighborhood all day, I figured I would run a few of them with her. Maybe even a couple hours’ worth. Ha. So I texted her shortly after waking up at 6:15 AM, and indeed she had already started a couple hours earlier. I found her running back towards Crisann’s house on Hearthfire Drive at around 6:30 AM. We chatted and laughed (ok, mostly laughed) and, as a little diversion from Alene’s planned two-mile out-and-backs, we took a detour to one of my favorite three-mile loops around the ‘hood. This includes a dirt-and-gravel recreational trail bisecting the Fort Collins Country Club’s golf course and Richard’s Lake, a hard-packed dirt County Road the wends by some horse farms, and the gravel Hearthfire Recreational Trail that goes past some wetlands that migrating Canadian Geese love to stop at. At the beginning of that loop, we spotted a familiar 60-something blonde in the distance running towards us: Joanne. Turns out she was going for her morning run by coincidence. She joined us on the loop. We were having fun. Indeed, I was enjoying the run and the day enough that I soon jettisoned the plan to run for only a couple hours or so. I was not going to run until 4:30 the next morning like Alene was planning on doing (“I need my beauty sleep,” I told her), but run until it got dark? Why not! 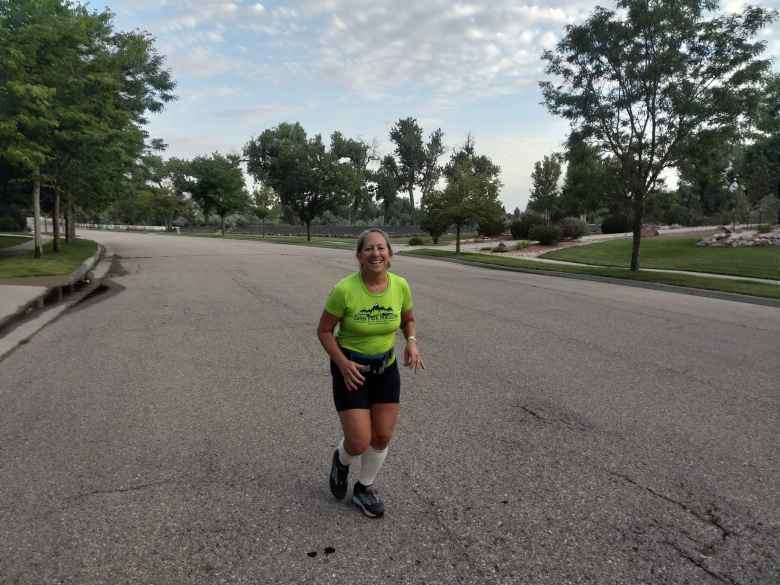 The rest of the day, then, we continued running/walking neighborhood streets, making pitstops every couple miles: Alene at the aid station she set up at Crisann’s, and me popping into my home two doors down to drink a glass of water, eat some food, and make an occasional bathroom stop. And feed Oreo, the friendly formally dressed black-and-white cat with a big appetite, before he got hangry. At some point, I let Alene carry on by herself, being cognizant of her need to be alone with her own thoughts. Also, my legs were still feeling fresh after 25 miles and I thought that it would be good training to do a bit more running (as opposed to walking). So I started running slightly longer loops around the neighborhood, encountering Alene now and then. The day was getting hot, which was not unexpected considering this was the third weekend of July. So before the phone’s weather app read 94 degrees, I ducked back into the house to put sleeves on my arms and a bandana around my neck for the sun protection. 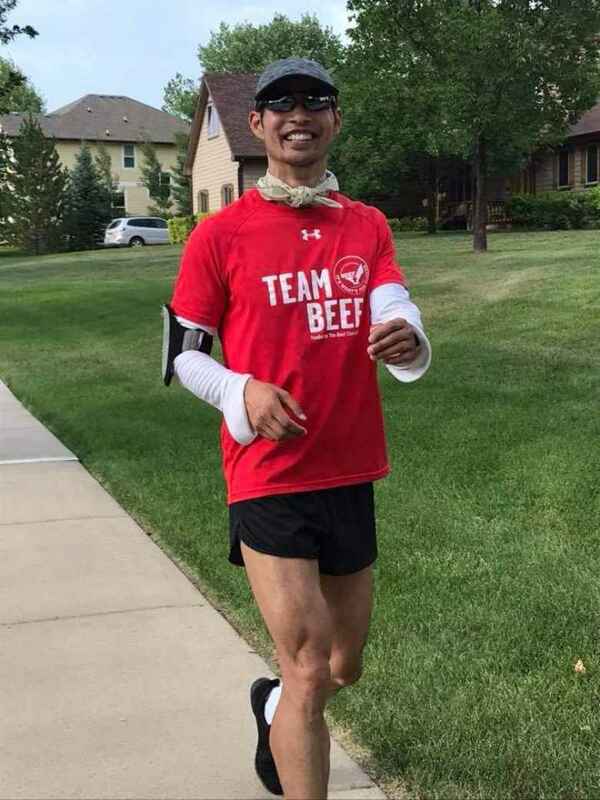 I also donned a red Team Beef jersey, which was about the only short-sleeve shirt made from technical moisture-wicking fabric in the master closet due to multiple home purging exercises. Alene cracked up when she saw the outfit. Something to do with the proclamation of a love for cows after 40 miles, I think. Alas, around dinnertime—or Chili Time, since I took an extended pause around 6:30 PM to devour a can of Hormel chili—Alene decided that she was going to stop at 8:00 PM, or 50 miles. In addition to getting heat rash, she was not feeling like she was ever getting into a zone due to the multiple distractions of homes, dog walkers, and other things to look at. Perhaps the monotony of running the same roads over and over again had something to do with it as well. In any case, I decided to stop at 50 miles as well. The problem was I was still a couple miles behind Alene due to the later start. Also, I had a case of “bad math” after putting the Garmin on the charger during Chili Time (the Garmin Forerunner 35 tends to throw a low-battery warning after using GPS for 12 hours) and then relying on my phone’s Strava app to log the rest of the miles. So thinking I needed to “make up” more miles than I actually needed to, I ran the last 10 miles or so with virtually no walking breaks except to make pit stops into the house for more water. I finished the day with, in fact, 51.8 miles in my legs. Not bad for a run that was even more impromptu than, say, the Quad Rock 50 from a couple months ago. At 8:00 PM, Alene was packing up the aid station at Crisann’s and she was muttering something about wanting a real ice cream bar. Alene didn’t seem the most enthralled about running endless laps through my neighborhood ever again, but I will keep my fingers crossed that next year her feelings may have changed. “Maybe your friend Spongebob will even come next time,” I concluded. Read Alene’s recap of our 50-mile adventure here.